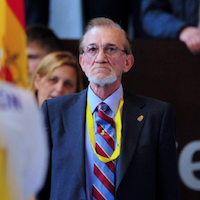 The former general director of the Spanish Handball Federation has died at the age of 69. Manuel María Meléndez Falkowski, who previously held the position of general director of the Spanish Handball Federation, has died at the age of 69. Falkowski was active in the Spanish Handball Federation for over 45 years, a role he combined with a professional career teaching at the National College of Physical Education in Madrid. In a statement, the Spanish Handball Federation praised Falkowski’s work for handball both on and off the court and the part he played laying the foundations for the achievements of Spanish handball over the last few decades. He was also well-known on the European stage and worked with the EHF on the successful organisation of the first Men’s European Championship held in 1994. On behalf of the whole European handball family, the EHF would like to express its deepest condolences to the friends, family and colleagues of Manuel María Meléndez Falkowski at this difficult time.